White Perch - Fishing with Gus! The white perch is a newcomer to Lake Norman. How it got here is anybody’s guess. Some surmise that it was transported with bait from other lakes. Its presence is considered a blessing by some and a curse by others. The average white perch is 6″-12″ long and weighs less than a pound. Currently, there are no size or creel limits on these fish. They are opportunistic feeders whose diet includes almost anything that floats, swims or burrows on the lake bottom. In addition to being prolific feeders, white perch reproduce in large numbers. 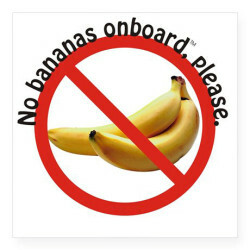 By some accounts, they have become too plentiful. They are credited with decimating the white bass population. The once abundant game fish is almost extinct, and is no longer considered a viable fishery on Lake Norman. Fishermen complain that not only have the perch slaughtered the white bass, but they have invaded brush piles that produced limits of crappie in the past. Perch are also believed to be playing a role in the declining stocks of largemouth and striped bass. Studies are underway to prove or disprove this theory. Once established, white perch can take over an impoundment. They are much like aquatic weeds that become entrenched and are difficult to control and remove. Because of its propensity to out populate other species, one angler referred to the feisty perch as “Hydrilla with Gills”. On the positive side, white perch are fun and easy to catch. Its tasty white meat is excellent table fare. They swim in large schools and are easy to find with a fish finder, or simply by drifting until they begin to bite. During the day, they settle over humps, points and brush piles at depths to thirty-five feet. At night, they migrate to the shallows near lighted docks and piers. White perch will hit worms, minnows, and small pieces of dead bait fished near the bottom that is attached to a weight and small hook. But, with so many fish biting, it is easy to run out of out of bait and re-baiting takes time as well. That is why so many anglers are using bucktail jigs, spoons and Sabiki flies to entice them into biting. By far the most successful lure combination is a string of six Sabiki flies attached to a bell sinker or jigging spoon. The Sabiki rig, as it is called, does not need to be baited. The fish are attracted to the brightly colored flies tied on small gold hooks. Expect, multiple hookups, and don’t be surprised when you reel in four, five or six perch at a time. Note: a rod rigged with six Sabiki flies might be too long for youngsters to comfortably handle. So consider cutting the pre-tied rigs in half and use three flies instead of six. The others can be used on a second rod. 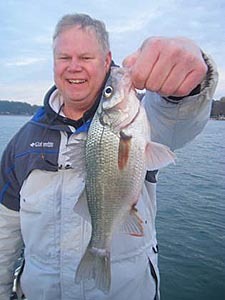 White perch are so plentiful on Lake Norman, that there is no size or creel limit. Keep all you want, because their white meat is delicious when fried in your favorite fish batter. White perch are the perfect fish to introduce children to the sport. They fight very hard for their size on light tackle, no casting is required (when using a Sabiki rig) and they are easy to tempt into biting. In case you are wondering, pre-tied Sabiki flies sell for two or three dollars a package and can be purchased at area tackle shops around Lake Norman.. Call 704-617-6812 or book your trip online today for a fishing adventure with Captain Gus.